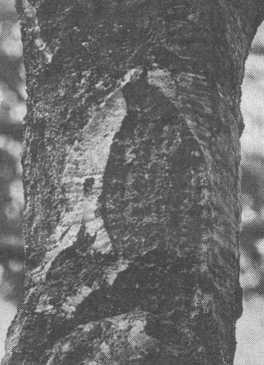 Our Lady of Watsonville is a foot-high image of the Virgin Mary seen in the bark of an oak tree in Watsonville, Santa Cruz county, California. Anita Contreras was the first to see Our Lady of Watsonville. On June 17, 1993, the Virgin appeared while Contreras knelt to pray for her children. Since then, thousands of pilgrims have flocked to the site, hoping for a miracle. The story of Our Lady of Guadalupe is a bit more dramatic than that of Our Lady of Watsonville. Juan Diego was a bit of an ascetic mystic, who frequently walked barefoot the 14 miles from his village to church in Tenochtitlan (Mexico City). It was on these walks that he had several visions of the Virgin Mary. He allegedly brought to the bishop his cloak on which an image of the Virgin had been painted (Our Lady of Guadalupe, shown here, is the centerpiece of the Basilica of the Virgin of Guadalupe in Mexico City). Many believe that the painting is of heavenly origin. Skeptics believe it was done by a human artist and passed off as being of miraculous origin in order to win more converts to Christianity. The name "Guadalupe" is Spanish and is a bit mysterious, since there was no town or shrine near Cuauhtitlan, Juan's village, by that name when the legend began. It is thought that the word derives from a Nahuatl word, coatlaxopeuh, which supposedly sounds like Guadalupe in Spanish and means something like "one who crushes the serpent." (The serpent can be identified with Satan or with the Aztec serpent-god Quetzalcoatl.) 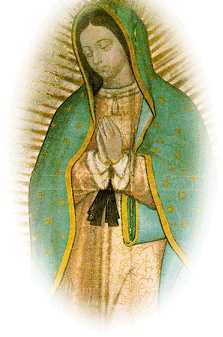 It is also possible that the legend has Juan saying that the Virgin was to be called Our Lady of Guadalupe because the one who invented it was Spanish. The creator of the name may have been intrigued by a statue of Our Lady of Guadalupe in Estremadura, Spain. In any case, it is easy to understand how a mystical Indian could become enchanted with Christianity. Not only did the new religion abound in stories of the miraculous, but the Spanish Christians had put an end to the Aztec empire. The Aztecs had conquered the Nahuatl and perhaps had even sacrificed a few of Juan's relatives to the hungry gods. The improbability of the story of Juan Diego, his visions, and the miraculous painting has not deterred the faithful from belief. In fact, only a deep religious faith could account for the continued popularity of Virgin Mary sightings. The skeptic understands the desire to have a powerful ally in heaven, one who will protect and guide, console, and love you no matter what troubles you have here on earth. The skeptic also understands how easy it is to find confirmation for almost any belief, if one is very selective in one's thinking and perception. We understand how easy it is to see things that others do not see. Having visions also makes one feel special. Thus, it is not difficult to understand how many people see the Virgin Mary in the clouds, in a tortilla, in a dish of spaghetti, in patterns of light, and in the bark of a tree. The cult of the Virgin Mary probably has its roots in goddess worship, which has its roots in the desire for a Good Mother, one who loves and nourishes, protects and guides, comforts and encourages. The Virgin is pure, clean, generous with her time, infinitely patient, unlike so many people one meets. She is often the harbinger of peace. The Mother gives birth and through sympathetic magic brings fertility to the tribe, the crops, etc. The Virgin Mary is the mother of Jesus who is believed by many to be God, making her the mother of God. She is also said to have been impregnated by the Holy Spirit, rather than by her husband, Joseph. She is not divine, according to the Catholic Church, but her devotees certainly seem to view the Virgin Mary as a goddess. A shrine to Our Lady of Watsonville has been set up near the soccer fields and playgrounds of Pinto Lake County Park. Father Roman Bunda celebrated Mass at the site on the 6th anniversary of the Contreras' discovery of the image in the bark. "For those who believe, no explanation is necessary," said Fr. Bunda. "For those who don't believe, no explanation is possible." He's right about the first part. See related entries on confirmation bias, faith, pareidolia, selective thinking, victim soul and wishful thinking.